Adding a Furry Family Member? Check Out the NHS Cat Sale! | Robert Hancock Co.
Who doesn’t love a great deal? The Nebraska Humane Society is at capacity so they are having a cat sale! Cats that are 6 months or older are FREE and cats up to 6 months are buy one get one. Brittany, the community manager at South Park, is a sucker for a good BOGO. Getting a feline from the humane society not only helps save animals lives but it will cost you less. All cats come spayed/neutered which eliminates an additional cost. All you would have to do is pay to license your cat and provide that documentation to the South Park office. Think about adding a new member to your home today! Below is a link to the cats available for adoption. Just a reminder that here at South Park we are cat and caged animal friendly! With the exception of dogs, ferrets and farm animals we are happy to give your new furry friend a home. In addition we require that all tanks or aquariums hold 10 gallons or less. 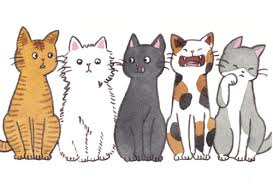 For cats, we do require a one-time refundable (at move out) pet deposit which is 25% of your rental amount and a monthly pet rent fee of $20 with a maximum of 2 cats per apartment. You will also need to provide documentation verifying that your cat is licensed, immunized and spayed/neutered.